Heat over to 375 degrees. Spray a 13x9 inch glass baking dish with cooking spray. In a large bowl, beat eggs. Then stir in pasta sauce, bread crumbs, onion, Italian seasoning, salt, and ground beef until well blended. Press mixture into the bottom of the pan. Bake for 45 - 55 minutes or until the meat thermometer inserted into the center of the loaf reads 160 degrees. Meanwhile, make both poaches of mashed potatoes as directed on the box using milk, hot water, and butter. Spoon off the excess juices from the baking dish. 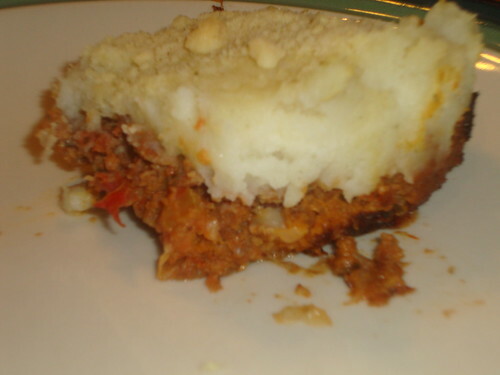 Spread the mashed potatoes over the meatloaf and sprinkle with cheese. Bake 10 - 15 minutes longer or until the potatoes begin to brown. Let stand 5 minutes before cutting.